Beauty Test Dummies: It's Another Giveaway! We are participating in another beauty blogger giveaway hop. This is a great chance for you to hopefully win some great new beauty products! Make sure to enter soon -- this giveaway is open through Oct. 22. What's the prize for fans of Beauty Test Dummies? Samples -- of course! 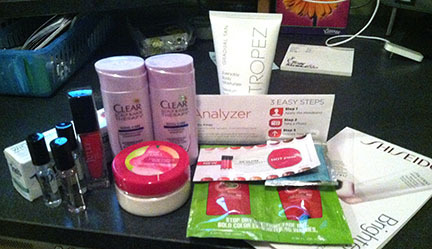 Enter to win a grab bag full of great sample-sized products. You get everything in the photo above, including a full-size Julep nail polish and deluxe samples of a Bath and Body Works Body Butter (in Sweet Pea), St. Tropez self-tanner/moisturizer and three Victoria's Secret fragrances. There is also Clear shampoo and conditioner, Tom's toothpaste, Shiseido White Lucent sample and others. This giveaway ends Oct. 22, 2012. Make sure to stop by our sponsor's blogs and say hello along with our participating beauty hosts, who also are hosting their own beauty blog giveaways.